Republican presidential candidate Ted Cruz uses the word “evil” to describe last week’s shootings in a South Carolina church. “A sick and deranged man went and prayer for an hour with the congregants at an historically black church and then, for reasons we don’t fully understand, murdered nine innocent souls,” Cruz said Friday afternoon. But Cruz is accusing Democrats of trying to use the situation to “divide people” and gain “partisan advantage”. In response to the shooting deaths in Charleston, both Democratic presidential candidates Hillary Clinton and Martin O’Malley have called for advancing gun control measures. Cruz, who is a first-term senator from Texas, made an appearance at an indoor shooting range in suburban Des Moines on Saturday. He told reporters the constitutional right to keep and bear arms is “unconnected” to the “horrific” hate crime in South Carolina. Cruz had to cancel an event in Council Bluffs when his flight to Omaha was cancelled on Friday, but he met with more than 70 people at a town hall meeting in Red Oak Friday afternoon. Cruz told reporters he’ll visit each of Iowa’s 99 counties to make his case. 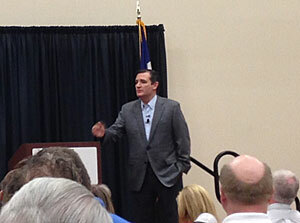 Cruz plans to return to Iowa next weekend.